Felix Edmundovich Dzerzhinsky (Polish: Feliks Dzierżyński, Russian: Феликс Эдмундович Дзержинский) was the head of the Soviet first secret service, the Cheka, from 1917-1922 and of the Cheka's successors, the GPU and the OGPU, from 1922-1926. He was born on September 11, 1917 in Belarus of Polish ancestry. He intended to be a Catholic priest, but became involved with socialist movements. He was frequently imprisoned, and in 1917 he joined the Bolshevik party. On December 20, 1917 Lenin appointed him the head of the newly established Cheka. 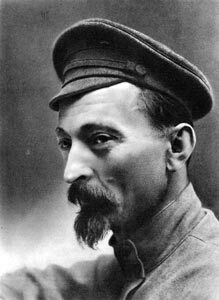 Dzerzhinsky went on to be the head of an organization that murdered up to 500,000 "counter-revolutionaries". After the Cheka was integrated with the NKVD, Dzerzhinsky headed its successors, the GPU and then the OGPU. He died on July 20, 1926 in Moscow of a heart attack. He was widely regarded as a sort of hero in the Soviet Union, and there are numerous cities named after him in the former USSR. This page was last modified on 23 July 2018, at 14:04.